Rogiet Poorland lies on raised ground near the edge of the Gwent Levels between Caldicot and Magor. The reserve includes a small area of remnant species-rich limestone grassland, along with woodland and scrub. The ‘Poorland’ was formed when an area of land was set aside in 1855 for the local labouring poor, when the rest of the land on the vast Tredegar Estate was enclosed. The land was farmed until the end of the 19th Century but was then was left derelict and used as a tip. Gwent Wildlife Trust bought the site in 1991 and restored the area as a reserve for wildlife. In spring there is a profusion of cowslips in the grassland, with early dog-violet also to be found. In summer, the grassland flora includes white campion, vervain, St John’s-wort, lady’s bedstraw and red bartsia. In late summer, wild marjoram, eyebright and common centaury dominate. A number of butterflies use the reserve, such as the brown argus butterflies which are attracted to the grassland flowers. Eyebright, with its attractive purple streaked flowers, is actually a parasite of plants such as clover and plantain, to which it attaches its roots. Parts of the reserve have been wooded for a long time which has enabled an interesting flora to develop. In the thickets and wood margins, look out for flowers such as red campion, bluebell, dog's mercury, lords-and-ladies, sweet violet and common gromwell. Much of the wood and scrub on the reserve has developed from the ungrazed grassland, and a wide variety of shrubs and trees have colonised the area. These include aspen, ash, birch, blackthorn, dogwood and wild cherry. Spindle, with its amazing pink and orange fruit, adds to the wonderful display of colour in autumn. Adders live and breed on the reserve; they are most likely to be seen in spring and early summer basking in warm sunshine on the edge of scrub patches. 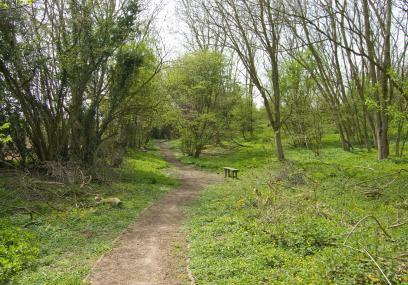 There is a circular footpath around the reserve. The path is gently sloping in places and there are some steps. From the B4245 in Rogiet, turn into Minnetts Lane, opposite the Severn Tunnel Junction road. Follow the lane under the motorway and bear left (pass Windmill Lane). The reserve entrance is another 1km on the right. There is parking for two cars at the reserve entrance (grid ref: ST 453 883). There is a concentration of GWT's reserves in the area, namely Magor Marsh, Brockwells Meadows and Lower Minnetts Field. The neighbouring Slade Woods contains a network of footpaths, and a very good diversity of woodland wildlife. Historical interest in the wider area is provided by Roman remains at Caerwent, and Caldicot Castle and Country Park. There is parking for one or two cars at the reserve entrance.